Q: In your view, what is the key challenge facing the nation today? A: A key issue, which is a recurrent phenomenon for most social problems facing Sri Lanka today, is the lack of will to move forward from simply being ‘satisfied’ to the next rung. There’s no motivation to strive for greatness. We stop at the ‘get-go’ and assure ourselves of contentment and satisfaction – and settle for being average. This is an obstacle to progress and the development of our nation. Q: What changes do you observe in the spheres of education and women’s empowerment? A: In terms of education, I believe that the trend of ‘questioning’ has elevated us from being the book-bound school generation to youth who are constantly seeking answers, and broadening our horizons and mindsets. Empowerment is not for women only because it is quintessential to the progress of humankind. As a sports enthusiast, empowerment becomes a fundamental of fulfilment if used alongside sports and recreational activities. This does not necessarily make other platforms redundant or less necessary but the universality of sports and recreation enables people to be their best by combining passion with a vocation to hone model individuals. Q: How can Sri Lanka retain the talent that it possesses? A: We are a multifaceted group that’s growing up in a land with no will or opportunity to retain the same youth that it took great pains to educate. Our plan for tertiary education needs to be more diverse to better accommodate the country’s multi-talented individuals. The system is archaic; and with times changing, so should we. The brain drain won’t be an issue if we know how to retain our youth. What we need is educational reform that’s aligned with changing global needs, and augmented by knowledge-based job-oriented education, which will undoubtedly open doors and refine the talents our youth possess. 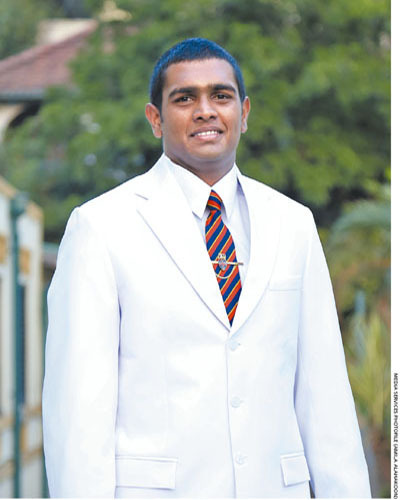 Q: What opportunities do you see for young Sri Lankans like yourself? A: While the opportunities are many, the key is to identify and cultivate them. Sri Lankan schools take pride in presenting a wholesome education comprising both academics and extracurricular activities. I believe that the opportunities we have right now, though limited, can take us far in life. I also believe that all available sports-related opportunities must be exploited. My advice to young people is this: find your element while you’re young and nurture it. A: We young people are a cohort of zestful individuals who are equipped with a passion to change the world for the better. This untapped potential must be harnessed and allowed to blossom with the same vigour. The will to initiate and take action is an important trait that must be inculcated among today’s youth while fostering the faculty of compassion will lead to better humanitarianism. A: What I expect from the world is a better understanding of its inhabitants, which in turn will be the tool to transform it into a more meaningful and humane place. There’s far too much sadness that goes by unnoticed. We need to inculcate the essential emotion of kindness to survive in the rapacious world in which we live. Q: And what are the challenges young people face globally? A: Surrounded by countless problems such as substance abuse, early maturity, violence, materialism, poverty and juvenile delinquency, youth are seen as being too adventurous and much more rebellious. It’s a known fact that the youth of our age – despite being advantaged – are a troubled species. But the real standpoint is that it is these same youth who will become the pillars of social, economic and political development. So society should value their imagination, ideals and energy, and try to understand them for who they are: rebellious millennials. Q: Finally, how do you view the growing importance of social media today? A: Social media is an essential facet of modernity. While it has its virtues, I’m more concerned with its many vices especially the ‘persona crafting’ that occurs on many social media platforms. There is definitely a bias on social media to make yourself and life appear much better than it really is. Either way today, it’s a given that life cannot exist without this constant link to the here and now.